7 Simple Phrases That Disarm Rude People FAST! 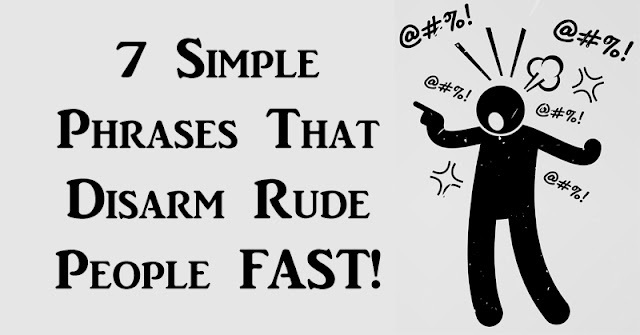 Home » »Unlabelled » 7 Simple Phrases That Disarm Rude People FAST! When someone is rude to you, it’s difficult not to get upset. Your initial reaction is often to fight back. If you resist your feelings to get angry and become defensive, you can respond to inappropriate comments and rude accusations without losing your self-control. This phrase won’t always signal the end of a conversation, but it will let the other person know that you’re willing to continue the conversation if they treat you with respect and consider your feelings. If this doesn’t work and the person continues to be rude, then try another phrase to put an end to the conversation. These two questions are effective in group settings. You can use them when someone tries to put you in an awkward situation or intentionally tires to upset you. If a rude person receives a calm and confident response from you, they’ll become flustered. These phrases give them a chance to redeem themselves. Someone who is constantly rude may not even realize they are being unpleasant half of the time. Using this phrase can stop a rude person in their tracks. It can make them take a step back and recognize their impolite behavior. This phrase works in a similar way to the phrase above. It can cause the other person to reassess their behavior and think about why they are acting that way. You can continue by encouraging them to reconsider what they say in the future. Sometimes the best way to get through to someone who is being rude is to explain to them that they are hurting you. Let them know what it is exactly that you don’t like about their words and why it offends you. By doing this, you may be able to protect yourself from inappropriate and rude remarks in the future. Unfortunately, rude people don’t always care who they are hurting. If you make your feelings to them known and it doesn’t stop them, this phrase will. Using this phrase will let them know that you don’t appreciate the conversation and you don’t want to be a part of it. Hopefully, the other person will think twice about saying something offensive next time.